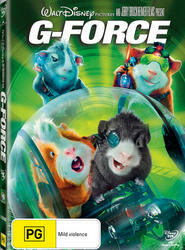 LET THE FUR FLY THIS JANUARY AS G-FORCE EXPLODES ON DISNEY DVD AND BLU-RAY FROM 27 JANUARY 2010! Get ready for a new breed of hero in this hilarious and heart-warming tale of teamwork, courage and determination as G-FORCE is released to Disney DVD and in the 2-Disc Blu-ray&trade; Hi-Def Combo Pack, which includes a Blu-ray Disc plus a DVD copy of the film in a single package, from 27 January 2010! In his first big-screen 3D film JERRY BRUCKHEIMER, creator of the Pirates of the Caribbean and National Treasure series of films, teams up with two-time Academy Award© winning visual effects artist HOYT H. YEATMAN JNR, in his directorial debut to create G-FORCE, a team of crime fighters like you've never seen before! An elite group of animal spies, G-FORCE is a clandestine espionage team of highly trained guinea pigs locked and loaded for their first big sting operation. Lead by Darwin (voiced by SAM ROCKWELL), G-FORCE members also include Blaster, the adrenaline-loving demolition expert (voiced by TRACY MORGAN), Juarez, the sassy counter-intelligence officer and martial arts specialist (voiced by PENELOPE CRUZ), a computer and operations specialist mole called Speckles (voiced by NICOLAS CAGE) and a literal fly-on-the wall reconnaissance expert known as Mooch. On the verge of saving the world and foiling the suspected evil plans of billionaire Leonard Saber (BILL NIGHY) and Saberling Industries to control the entire population through household appliances, the specialised taskforce is unexpectedly shutdown by the FBI. These highly-trained guinea pigs quickly find themselves in their worst nightmare - as regular household pets up for sale in a pet shop! With global security at stake, the G-FORCE escape to complete their mission as rogue agents, determined to stop Saberling Industries before the 'Saber Sense' chips detonate and begin wreaking worldwide havoc! Armed with all of the latest in miniature spy technologies, the G-FORCE encounter new characters along the way including civilian guinea pig Hurley (voiced by JON FAVREAU), and Bucky, the overly territorial hamster (voiced by STEVE BUSCEMI). What's more, the crime fighting team discover startling and heart-warming details about their past, and that the true enemy of the G-FORCE is not quite who or what they expected. Loaded with cutting edge special effects and never-before-seen bonus features including deleted scenes, music videos, 'Blaster's Boot-Camp', 'G-Force Mastermind', 'G-Farce Bloopers' and audio commentary, G-FORCE is a hilarious, edge-of-your-seat action-adventure that the whole family will love! Be a part of all the G-FORCE action when you bring it home on Disney DVD and the 2-Disc Blu-ray&trade; Hi-Def Combo Pack from 27 January 2010!